Hi. I'm just nearing the end of Full Circuit after a long time out of training. Looking to progress onwards towards Military Fit. Is this too much of a leap of is there another program that would be a better suited in between? The same program doing it a bit harder, maybe? 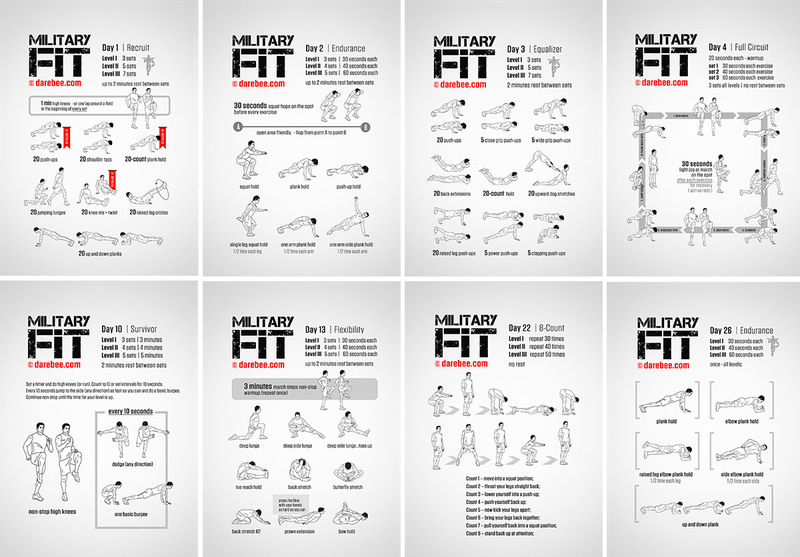 Military Fit seems to be oriented more in strength than streamline, so looking the list of programs available here, from level 3 to 5, there are a bunch of them to choice!! Military Fit might be a big step up from Full Circuit go and chekout the Preview or just give it a try for a day or two. ​​​​​​​I don't know if it will help but I made this back in 2017 so it is out of date but it's an overview at least. I should probably update it now. I've opted for 30 days of Gravity but I've also been doing some cardio in the gym as well as weights. I would also recommend 30 days of Gravity or Strength before Military Fit. Those two programs will give you a good solid example of what to expect out of the strength style programs here on Darebee and they will lay some good foundations for stepping into Military Fit afterwards if you would still like. That being said MF/+ was a blast and I would do it again in a heartbeat. It will challenge you quite well. If you are up to it I would say just jump in head first and it you end up doing it on level one with modifications then so be it. If not then take a step up approach with Gravity or Strength.